Effective August 10, 2017. The L-Tron Corporation, headquartered in Victor, NY is proud to announce its recent ISO 9001: 2015 Certification. L-Tron is a leading provider of off-the-shelf and customized data acquisition, data collection, and industrial automation solutions. The ISO 9001: 2015 certification, which took an intensive year to achieve, provides additional credibility that the company is highly devoted to its customers through quality management, quality assurance, and continuous improvements to critical processes. The ISO (International Organization for Standardization) sets the certification requirements, which are achieved by meeting a set of international standards on quality management and quality assurance. Through grant assistance and a process of close auditing, L-Tron earned the Certification. – Partner and COO Gayle DeRose. For over 40 years, L-Tron has focused on clients and their results. The Company, which currently employs 15-20 people, provides complex technology solutions by working collaboratively with customers to define, develop and deliver personalized solutions for large and small businesses, state and local government agencies. 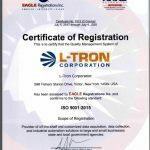 L-Tron is excited to share the ISO 9001 news with our clients, customers, partners and the L-Tron family.